Northampton MA, Wednesday, March 16, 2016 - The Arcadia orchestra, joined by the vocal arts ensemble Illuminati, performed Mozart’s “Requiem” in Sweeney Concert Hall at Smith College Saturday, before an attentive and enthusiastic audience that nearly filled the hall. Northampton MA, Wednesday, October 29, 2014 - The Arcadia Players performed the music of Beethoven Sunday, and the experience was pure delight. The professional orchestra ... is led by Ian Watson, the conductor and a brilliant keyboard player, who was recently appointed to the prestigious post of resident conductor at the nation’s oldest music society, the Handel and Haydn Society of Boston. Northampton MA, October 7, 2012 - Arcadia Players launched its 24th season Saturday evening, presenting a bouquet of classical concertos to a large and appreciative audience in Smith College’s Sweeney Concert Hall. Northampton, MA, Thursday, March 12, 2012. A large and appreciative audience enjoyed the final concert of the 2011-12 season by the Arcadia Players on Saturday at Smith College in Northampton. The program consisted of Bach's six Brandenburg Concertos, played (unusually, as the group's director, Ian Watson, pointed out) in numerical order, so that each half of the program ended with one of the two concertos written for stringed instruments alone. Bach himself described the concertos as "Six concertos for several instruments," and the variety of instruments was a pleasure for the sight as it was a joy for the sound. The Arcadia Players is a professional group of soloists, whose excellence justifies their small numbers. The largest group on stage in the Brandenburg concertos numbered 12, besides Watson, yet their sound was pure and rich. 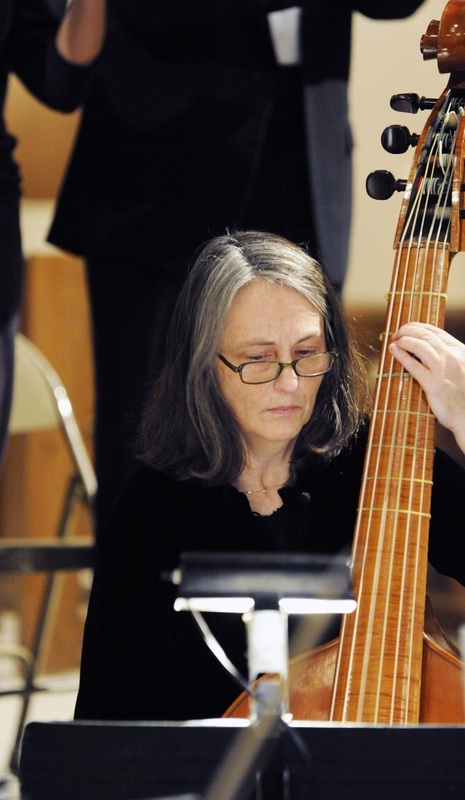 In their brilliant performance of Handel's Messiah at Mount Holyoke College in December, their orchestra had 23 players and the chorus had perhaps two dozen singers - yet the sound was as exciting as that of far larger resources and more beautiful. We are fortunate in the Pioneer Valley to have music of such intellectual and emotional excellence, performed by gifted players, who are led by a director who demands and gives performances of the very highest quality. Worcester MA, October 17, 2011 - The appropriately named Arcadia Players adroitly presented a Beethoven twin bill Sunday afternoon at Assumption College’s Chapel of the Holy Spirit. The group’s protean director, Ian Watson, reversed the order of composition and led off with Beethoven’s 6th symphony “Pastorale” and concluded with his heroic 5th Symphony. Such a program provided a substantial challenge to the period instrument ensemble. Gut strings notoriously wander in and out of tone, and with no vibrato every deviation can stand like a proclamation; valveless horns, or “natural” brass instruments or wooden flutes are incredibly recalcitrant in yielding accurate sound. Yet the Players, in an almost miraculous demonstration of focus and concentration, produced wonderfully fluent, deeply engaging music. ... as always, Watson brought a singular, intensely musical interpretation to the five movements [of the 6th symphony], fusing them into an organic whole that seemed to shimmer in a sweet persuasion that simply obliterated the very rare off-target note inevitable in period-instrument music-making. This was exceptional and beguiling Beethoven with all levels, layers and threads made brilliantly clear. ... In the recent controversy over Beethoven’s original markings, Watson clearly sides with the “faster is truer” advocates. He set a blistering pace and his players rose to the occasion. The furious woodwind work was spot-on, and the churning strings fiercely kept up. Watson emphasized the submerged throbbing tension of the work and summoned more and more from his musicians. He crouched, gyrated, rotated, veered off into Karate Kid “wax on, wax-off” motions, and literally shoveled crescendos using a remarkable bowling motion with his left hand from his ankle to the sky. The Players followed his every move, matching sound to gesture in a throttling mesmerism. The tensions swelled in nifty, escalating tautness — relieved blessedly with those familiar Beethovenian gunshot chords. The overflow crowd surged to an equally explosive ovation. A gifted director offers a version of Xerxes that's eye-poppingly contemporary. Northampton, MA, 30 June, 2011. You can bet that when the first Handel opera to be produced in the United States was staged in Northampton in 1928, there wasn't a shopping cart on stage. Nor is it likely that one singer was costumed in gleaming festoons of cans. So what do shopping carts, cans diverted from the recycling bin and singers sauntering around the stage barefoot or in punk outfits have to do with the story of a Persian king who could raise an army of two million to fight the Greeks?The answer lies in the imagination of Eve Summer, director of Handel's Xerxes, which played at Northampton's Academy of Music last Saturday evening. Summer's imagination has a long reach; you see it in the subtitles she writes for the operas she directs—including Cosi fan tutte (2009), also played at the Academy—in which street language pops like firecrackers. Summer has a gift for translating classic symbolism into familiar detail with just enough flippancy to bring out the fun of the opera without skewing the emotional equation. Since Handel himself was criticized for adding elements of comedy to Xerxes, she was on solid ground. ....All the singing in this production was flawless, and every role had its memorable touch. To costume designer Kathleen Doyle go the plaudits for the glittering cans and shopping cart full of frou-frou that decorated Elviro (Darian Worrell), disguised as a flower seller to avoid the king's notice as he carried Arsamene's love letter to Romilda, and the hot lime tote bag the king's injured fiancee Amastre (Desiree Maira) brought as she arrived on the scene. A stellar performance by the 12-person Arcadia Players ensemble, with Watson playing harpsichord and directing, created an effect that was sprightly and intimate at the same time. Irrepressible color, visual and vocal, made the piece a delight and a testament to Summer's gift for banishing stodginess from an art form too often seen as fossilized and elitist. New London, CT, 12 June, 2011. 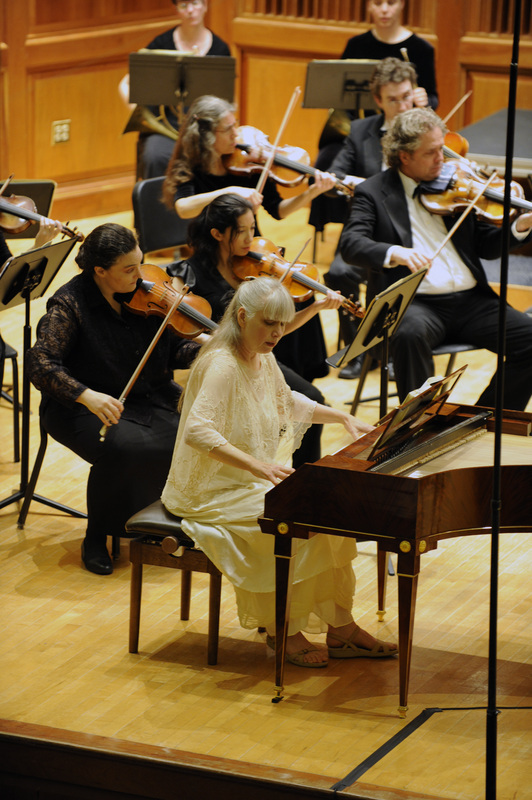 Last night 11 June, the Connecticut Early Music Festival began its 29th season with a rousing, light-hearted, staged performance of Handel's SERSE presented by Arcadia Players of western Massachusetts. The humor and pathos of Handel's opera of love rivalry, crossed signals, and deception was finely conveyed by a production with singers dressed mainly in contemporary punk style by costume designer Kathleen Doyle and who under stage director/producer Eve Summer portrayed every nuance of their characters. ....Arcadia's beautifully performed, audaciously but credibly staged SERSE compared well to the NY City Opera production from the 1990's. 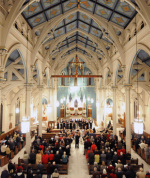 Arcadia Players give superb rendition of Bach’s "Mass"
Worcester, MA, 12 October, 2010 - The intricate polyphony, unusual harmonies and extraordinary length of J. S. Bach’s “Mass in B minor” make it a challenge for its performers as well as its audience. When the added complexity of sustained emotional intensity is factored in, it is easy to understand why the piece is so seldom performed. 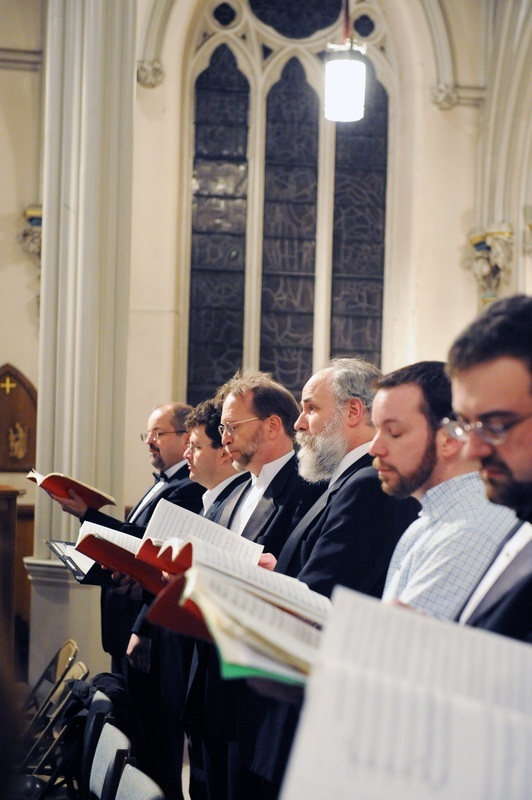 Worcester audiences had a rare opportunity Sunday to hear Bach’s masterpiece presented by the Arcadia Players, conducted by the group’s artistic director, Ian Watson, in St. Paul’s Cathedral. ... The Arcadia Players’ performance was marked by a sustained level of emotional intensity reflective of the players and by attention to the smallest details of performance practice. The perfectly matched vowel sounds of the chorus, the rhythmic precision of the entire ensemble, the beautifully shaped phrasing and the dramatic use of dynamics made this a performance of the highest quality.